How can i promote my campaign on Good Fridays? 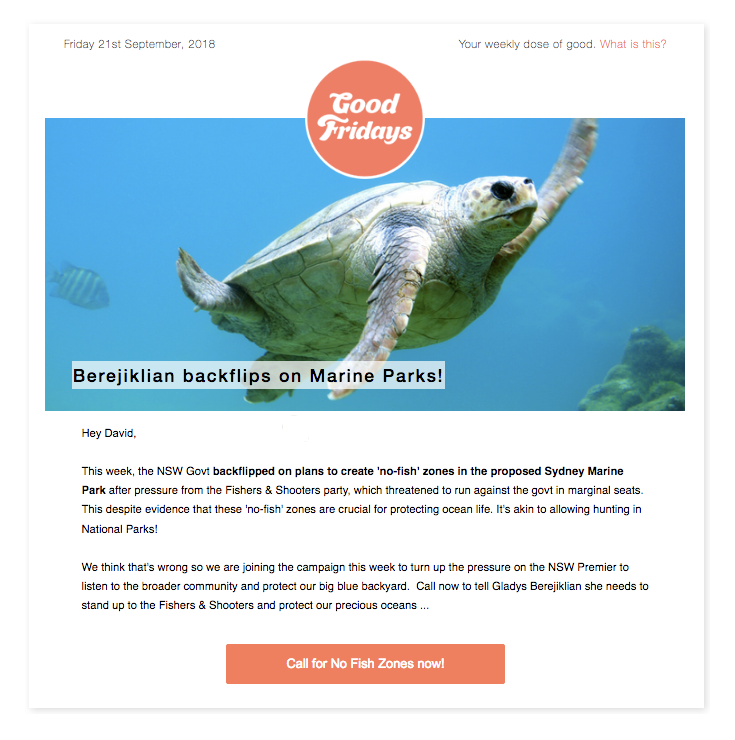 Good Fridays is a weekly email sent to progressive Australians. It is available as a low cost service to amplify your campaign each week. Good Fridays is a weekly email we send out to inspire progressive people to take action. If you have a new campaign or an important inflexion point in your current campaign and you need extra support outside your networks we can help. Each week we curate three campaigns and send them to our Good Fridays list (>25,000 and growing). Our comittment to our ‘goodies’ on the list is to send them actions that have a real chance of making a difference that week. Our open and click through rates are very healthy and we’ve seen hot issues recieve solid responses from supporters – so if your campaign is surfing the zeitgiest on any given week get in touch to discuss running a promo for you in that week’s edition. Or next time you are launching a new campaign and need some quick list growth, or your campaign needs a kick along at a critical time, contact us. There are three spots each week, a hero and two smaller campaigns. The Good Fridays list is growing quickly and our action rates are on par with the best in the business. Learn more about Good Fridays here. See recent examples of the campaigns we’ve supported here, here and here. We’re currently building the list and growing our community meaning you can get good results for relatively small outlays. A typical email campaign is seen by around 10,000 people, hero campaigns recieve between 500-1,000 click throughs and most campaigns can assume approx. 40-50%+ conversion rate. Based on the above you might pay between $500-700 for a campaign that yields 300-500 actions and new contacts with 10,000 people becoming aware of your issue. Good Fridays is sent every Friday morning and promotion cut off is Thursday 5pm. We write the copy based on your campaign so all you need to do is contact us and nominate your campaign. (we have a commitment to curate for our list so cannot always guarantee we can run with a campaign on a given week).